We have covered the variety of magazines and iBooks available for the iPad here before. Today, let’s talk apps disguised as books and books disguised as apps. 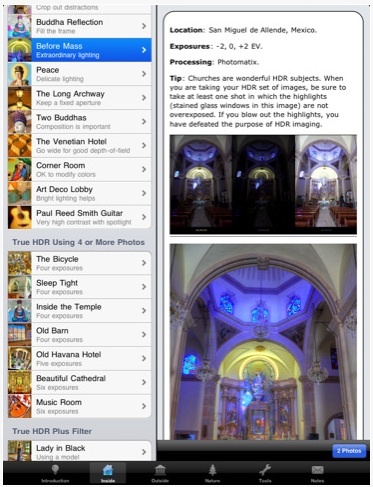 The list is long of stand alone apps that are actually interactive eBooks. They offer more than page turning by including clickable areas, enhanced navigation, and generally video too. Several magazines are doing this rather than appearing in Zinio as what would be thought of as a PDF of the print magazine. 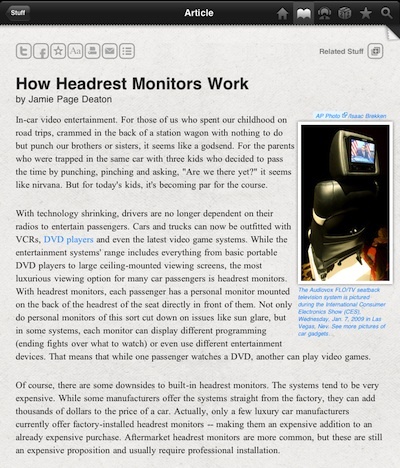 Most known on the interactive magazines is Wired. For eBooks that are more than pictures of pages, it is a bit more difficult to search and find since they appear as apps. An example is Rick Sammon’s iHDR ‘app’. It is actually a interactive book wrapped as an app. It does NOT do anything with actual taking photos and processing them. This is truly a ‘How To’ eBook for fans of HDR photographs. That is the fine line, app that do things and apps that are information only. Read carefully when looking for an app to be sure it is an application with actions versus an interactive eBook. Other ‘eBooks’ that are actually apps is the new How Stuff Works app. When you launch it, it looks like a eBook with nice interactive features. It is actually a app that reaches out to the How Stuff Works site and pulls in your requested information (40,000 available articles) with links, related and videos (12,000 videos and 2,000 audio files). 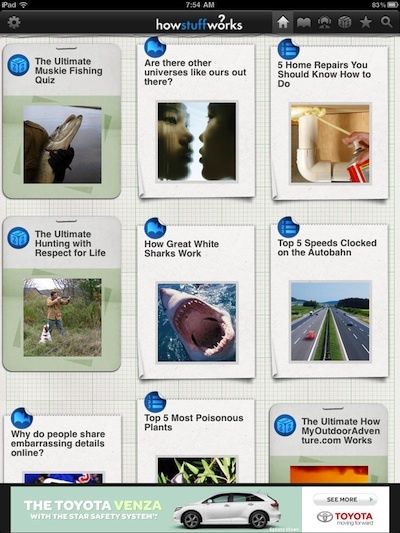 Launching the ‘How Stuff Works’ app takes you to a scrollable screen of Today’s interesting article thumbnails. If your looking for a specific subject, click the ‘search’ icon on the far right in the upper corner to enter. As you can see above, the free app is supported through ads appearing across the bottom of all screens. 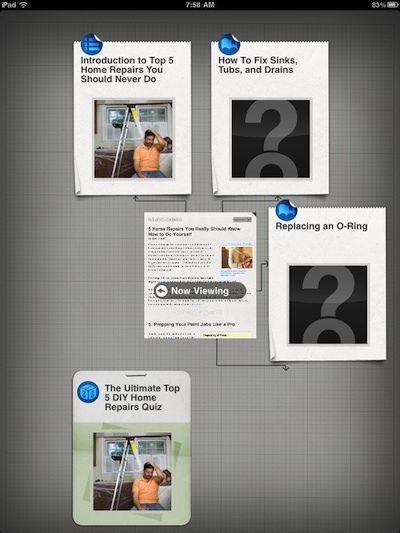 Tapping a article thumbnail results in a view of the How Stuff Works article like you would see via the Web site. Taking the eBook that is actually an app to heart. How Stuff Works offers a graphic view of ‘related’ articles. Rather than a list, you are given content thumbnails that spider off of the article you were just reading. The second tab option in the upper right corner of How Stuff Works is articles divided by categories. We call this the ‘do you feel lucky’ area as you never know what you will get. 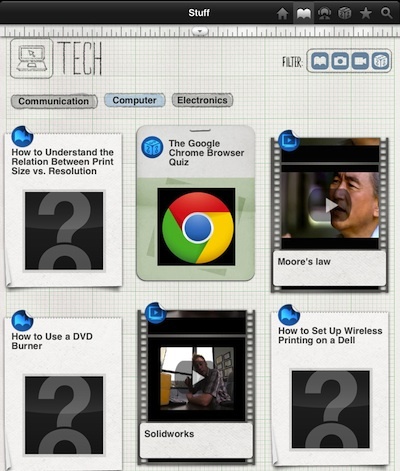 Notice the Filter buttons that allow you to choose if you want the articles sorted by text, images, video or quizzes. The icons in the upper left corner of each article thumbnail tells you what you what format the article you will be viewing will be in. There is a variety of areas to choose from in what we called the ‘do you feel lucky’ area of How Stuff Works. Find an area of interest and get lost for many hours. Additional features of How Stuff Works is marking articles as Favorites for quicker reference later and ‘Quizes’. You can choose a quiz from a variety of groups to see how much you learned from the articles you read. It’s a nice way to challenge yourself and see if you did more than just gloss over a bunch of eBook text.